Em oi! #312: Cow’s THAT Strike You? B. noted that when he asked about Belleville, he was more trying to verify that I was naming a village and not, oh, a restaurant or some obscure rock formation. Wait — you, my dear readers, don’t know where Belleville is either? I guess this is a forgivable sin – according to city-data.com, the population was 2,265 as of July 2008. It’s somewhat southwest of Madison. I headed out on Saturday morning to do about 30 miles. I am training for a triathlon and I thought I would ride part of the bike course (about 12 miles), then swing back to our house in time to shower and have lunch before I had to start cooking for a dinner party. I didn’t realize that when they say “a challenging and hilly course,” what they mean is hold the hell on to the handle bars. I’d been out for about an hour and 45 minutes; the weather was chilly but changeable, drizzle one moment, sun the next, a wind from my right neither helping nor hindering my progress. I was trying to find County Highway A – I later realized it was unmarked and I’d passed it by a good four miles. But at the time, I didn’t know that. I remember looking to my right across across a wide, green valley. At the far end were some tree-covered hills and a fine mist was beginning to form at that end of the valley. There were dark clouds above which seemed to be gradually dripping toward the ground – not in a tornadic sense, just the way that precipitation looks when you see clouds at a certain distance. With a whoosh of wind, the mist caught up with me. It wasn’t rain at all, but tiny ice pellets – sleet or hail, I’m not sure which. I turned down the first street I passed and sprinted for a strand of oaks at the edge of a farmer’s field. In the lee of the tree, I pulled out my phone and called Bryan. He arrived twenty minutes later and the bike and I went home in ignominy. It was good that I had service. Three or four miles earlier, I’d tried to use its GPS functions to figure out where I actually was, and it placed me in the middle of a corn field. Oops. 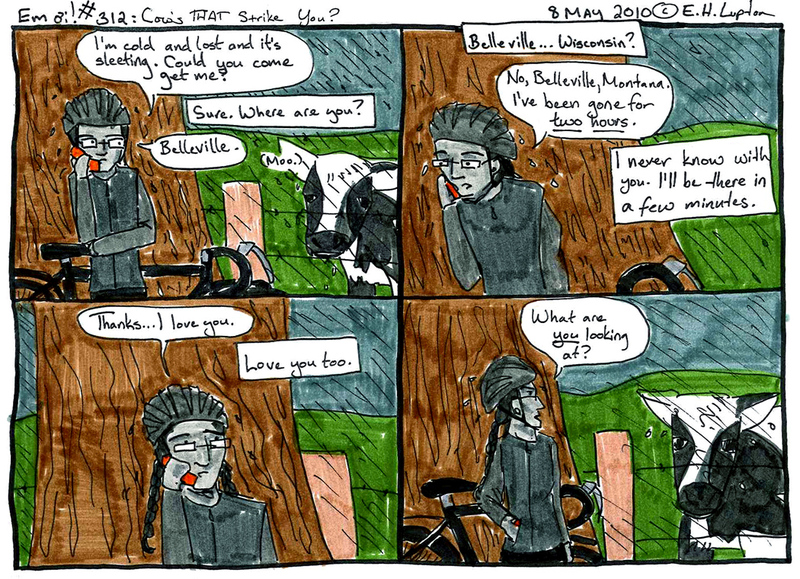 Cycling — Training — Comic books, strips, etc. If you’re super curious, I ride an old Bianchi touring bike (how old? Not sure, maybe ten or fifteen years). It is black. I got it on Craigslist. MK and I have been on both sides of this one several times. T-storms, cold, mechanical issues… Get used to calling for a rescue. It is very nice to have someone to call. I don’t know what I would have done otherwise. Waited for the storm to pass, then biked the last 13 miles home (chilled), I guess. It would have sucked.